Can’t always find a perfectly ripe mango? No problem! This water recipe uses a semi-firm mango infused at room temperature to quickly and effectively draw out the fruit’s flavor. This thirst-quenching water is healthy, fast, and fresh: your new go-to drink for summer! 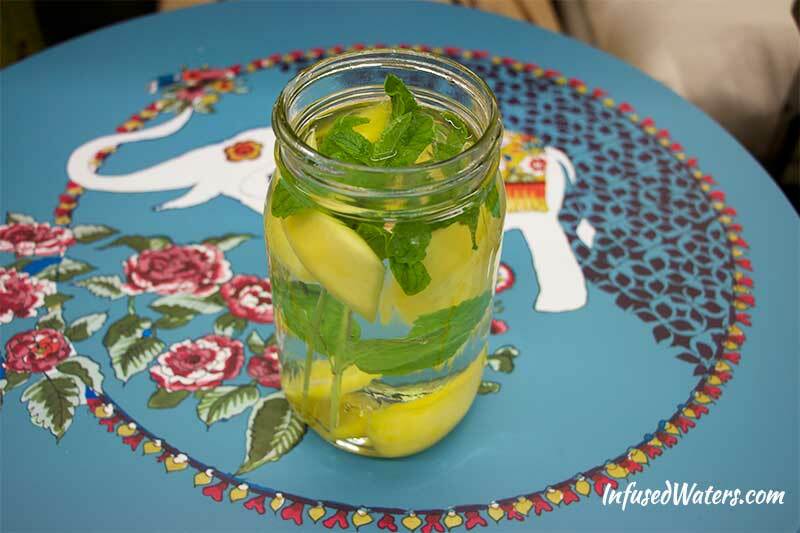 Combine the mint and mango with water and let the infusion sit for 3-4 hours at room temperature. The warmer temperature helps the ingredients’ flavors intensify more quickly. 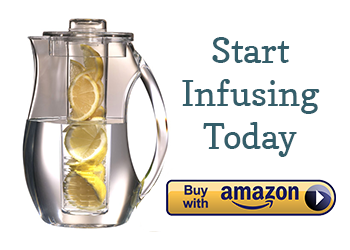 You can also infuse in your refrigerator for up to 12 hours. When ready to drink your mango mint masterpiece, simply stick a straw right into the jar and enjoy! After infusing and drinking, you can try to eat the mango pieces. I found that the infusion process had made them softer than when I had started. *Note: I’ve waited a long time to post a mango recipe because I always had trouble finding ripe mangos all the way up here in NW Oregon. However, after a couple of experiments, I learned that the delicious mango flavor is very much present in young mangos; they are just lacking that soft texture that makes them easy to chew. 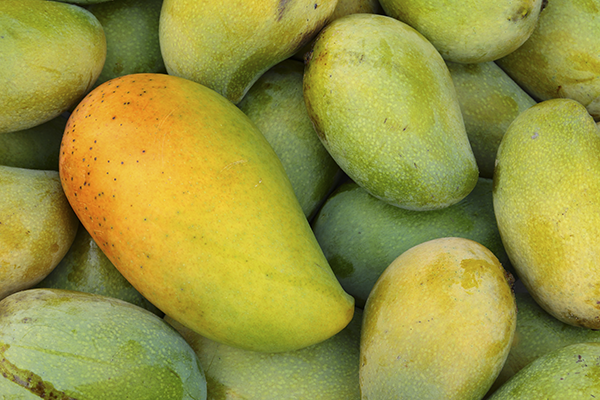 Of course, ripe mangos will have even more flavor, so use them if you can. The mango I used for this recipe was mostly green with just a hint of ripeness/yellowing. Mmmm..this water looks and sounds so delicious! So happy to have found your site! thanks for a useful recipes of infused water. am happy to gather a lot information from you. Hello Amanda! I have a question I left my infused water overnight a room temperature for more than 8 hours. I made it of ginger & blackberries. Will I get sick for leaving out so long? You should be fine. Being immersed in water does help fruits to maintain their composition (as opposed to being exposed to airborne or surface bacteria), but water is still not a preservative and you should not keep infused waters out at room temp for much longer than 8 hours. Tip: lemon is a natural preservative. If you plan on infusing overnight at room temp, I recommend that you do so with lemon. Hello. I’m new to all this infused water. Yesterday I bought 3 types of mint, spearmint, chocolate mint, and strawberry mint. Is there a specific type of mint leaves you use? And also noticed in another recipe you used basil…now is that plain basil? Sweet basil? Why do you suggest organic fruits instead of regular fruit. I’m new to infused water and I just wanna know the difference. Hey, I just tried the mango mint but I also threw in a sprig of fresh rosemary and WOW! It was so good! I used some pre-cut mango from Walmart and it was nice and sweet. I’ll be trying the grapefruit rosemary next! So happy to have found this website. I’m drinking so much more water this way! I’ve tried the lemon/lime/cucumber water; am infusing a mango/mint right now. Can’t wait to try it. So many more just on this website. Thanks for sharing with the rest of us. Hi, I’m Amy. Nice to meet you!